In light of the upcoming launch of the FE Passive Fund Rating, we take a look at all the issues investors need to get to grips with when looking at index trackers. For FE's new section dedicated to passive funds, click here. Any conversation about investing will eventually come round to the active versus passive debate: is it better to pay more for a manager who will take ‘bets’ in the hope of beating the market or to just accept market-like returns and make a big saving on management fees? There’s no definitive answer to this of course, but the second approach – which is known as index tracking or passive investing – has a strong following in the US and is growing in popularity at an ever increasing rate in the UK. Index investing revolves around the view that it is difficult to outperform the market over the long term so attempting to match its performance by tracking it as closely as possible is the best approach. These products have a very simple objective: follow an index’s performance but don’t add to effort or cost in trying to beat it. There are advantages to passive investing. Tracking an index means that risk is spread across the market, thus reducing the chance of an investor finding themselves overly exposed to one area just because it is the favoured hunting ground of an active investor. History tells us that active managers are by no means guaranteed to get their calls right. This approach also cuts down on research and trading costs, meaning trackers tend to have an automatic head start ahead of their more expensive rivals. 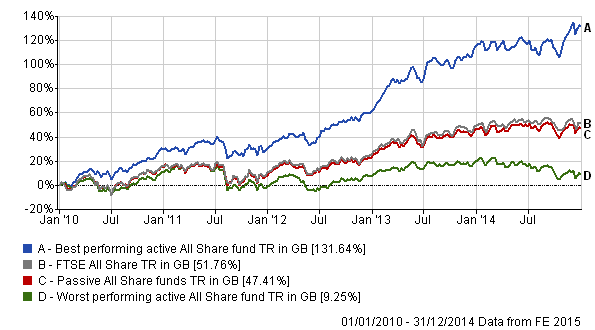 The below graph, which spans from 1 January 2010 to the end of 2014, shows the returns made by the FTSE All Share, the average tracker covering it and the best and worst performing active funds benchmarked against it. It demonstrates that while active investors can make gains far beyond the index’s, they can also fall significantly behind it – while the trackers keep broadly in line with the market. However, there are risks too. Investors in tracking are fully exposed to broad market declines, whereas savvy active fund managers can protect their investors by holding parts of the market they expect to hold up well. They can even up their exposure to cash if they feel particularly threatened. Moreover, as with any fund, there’s always the risk of picking the wrong product. While in a perfect world all passive funds would be equal, there’s a number of key issues that differentiate them and can make some perform much better than others. Just because you buy an index tracker does not necessarily mean you get index returns. Indeed, sometimes the difference in performance can be significant. This is where the FE Passive Fund Rating comes in. Using quantitative analysis, FE gives passive products a rating based on how successful they’ve been in replicating their chosen benchmarks. The results are based predominantly on tracking difference and tracking error. Funds are scored between one and five – five being the highest. Around 250 products across nine asset classes are rated, though this number is subject to increase depending on demand. More details of the ratings methodology are outlined here, but for those who are new to passives, here's a guide that outlines everything you need to know about them before investing. Passive investors typically make use of two kinds of fund: traditional indexed funds (often referred to as trackers) or exchange-traded funds (ETFs). Trackers are essentially the standard unit trust or open-ended investment company (OEIC) that most investors are familiar with, but they are not actively managed and simply seek to replicate an index. They are bought directly from a fund management company or through a platform. The aim of an ETF is the same. The key difference is that these products are traded on stock exchanges, meaning unlike unit trusts and OEICs they are priced continually through the day and investors can buy or selling whenever the exchange is open, rather than at limited times. Both have their own advantages. For example, conventional trackers do not incur the transaction costs that ETFs do when they are traded; meanwhile, ETFs often give access to niche areas of the market and can be used to make quick and tactical portfolio changes. The most obvious way to track a market is to buy all its constituents in the weighting set by the underlying index. This is known as full replication and should, in theory, mean that the trackers performs in line with the index, with the effect of costs creating some unavoidable underperformance. However, not all funds use this method – others use partial replication, where only a sample that is considered to be representative of the wider index is held. Funds tend to do this when buying the full index would prove prohibitively costly. An example is the MSCI World, which covers over 1,600 businesses in 23 countries. Both of the above methods are physical replication, where the index funds actually own securities of the index that is being tracked. Another method called synthetic replication is used by some funds, although this does not provide the peace of mind given by actually owning the underlying assets. Synthetic replication involves the use of derivatives called ‘performance swaps’, where the fund buys a contract that gives a pay-out equal to the return of an index less the fee charged by the counterparty. While this does create counterparty risk, it does allow ETFs (which are the main users of synthetic replication) to offer exposure to esoteric areas such as commodities and the more hard-to-access emerging markets. Given that the issue of costs often drives investors to passive funds in the first place, it’s no surprise that this is one of the first things they consider. Costs are of course very important; while some trackers are very cheap, charging less than 0.1 per cent in some cases, others are almost as expensive as active fund managers. However, while a cheap tracker has an automatic head start, this doesn’t mean it will necessarily deliver a better result. Some of the cheapest trackers on the market have been very poor at replicating their index, which in most cases cancels out the cost advantage they had in the first place. It is for this reason that costs should always be considered in the context of tracking difference. Costs are one of many factors that influence a tracker’s performance, but as with active management, they are not the be-all and end-all. Given that most investors are holding a fund in the hope of generating returns, tracking difference is one of the most important things to understand when holding passive investments. Tracking difference looks at the annualised relative performance of a fund compared with the underlying index. So if the FTSE 100 rises 10 per cent and your FTSE 100 tracker goes up just 9 per cent, then the tracking difference is 1 per cent. As the aim of index investing is to mimic the performance of the market, the smaller the tracking error the better. But it’s worth keeping in mind that this will never fall to zero, as the impact of fees – no matter how small – on performance means the passive will lag its underlying index. While tracking difference shows the outcome of a passive investment, tracking error measures the journey the investor went through to get there. This metric is a measure of the volatility of the difference of the returns between a fund and its benchmark. A fund that perfectly replicates the performance of the underlying index will have a tracking error of 0, as its day-to-day movements will be the same. However, funds with a high tracking error will give their investors a very different experience. A fund with a very high tracking error, say 1 per cent, will deviate from the underlying index on a regular basis. This means even if the tracking difference at the end of a period is 0, there will have been days when the fund significantly underperformed the index and vice versa, which some investors may not be comfortably within their passive strategy. The size of fund is typically an issue with active management and not often discussed when it comes to passive funds. However, FE’s analysts see fund size as being an important factor when it comes to passives as well. One reason is because reaching a certain size allows a tracker to benefit from economies of scale when physically replicating an index. While many investors are wary of putting money into a very large active vehicle, funds are better off the bigger they are when it comes to passives. Furthermore, size is a positive with ETFs. As listed vehicles, a larger size can be indicative of better liquidity, which means lower buy/sell differentials. This is the big question and one where there’s no set answer. A passive approach frees investors from the task of fund selection and eliminates manager risk, leaving their returns in the hands of asset allocation. There are, of course, many areas of the market which investors can take passive exposure to. The FE Passive Fund Rating is designed for UK retail investors, and is not a universal passives rating system. It therefore only focuses on trackers for sale in the UK, which on the whole have mainstream benchmarks. Complex vehicles such as leveraged and reverse ETFs have been discounted, for example. UK Equities: Most UK investors will have a high weighting to domestically focused funds and there are a number of options open to them in the passive space. Companies such as Vanguard, iShares, HSBC and State Street Global Advisors have products tracking the FTSE 100 and the FTSE All Share, while there are more specialised products focusing on specialised areas such as mid-caps and dividend-paying companies. US Equities: The US equity market has proven to be a difficult one for active managers to outperform, due to the fact that it is so researched and efficient. This has led to many investors – even those who would typically opt for an active approach – using indexed funds to gain exposure to the world’s largest economy and its businesses. Given the popularity of passive investing here, there’s a wealth of products covering the main S&P, Nasdaq, Dow Jones and Russell as well as niche areas such as minimum volatility indices and value or growth stocks. European Equities: The European market has had a tough time over recent years, with investors slow to return to the region after the global financial crisis and the subsequent eurozone sovereign debt crisis. However, sentiment has started to turn after the European Central Bank moved to stimulate the economy. Given its proximity with the UK, Europe is home to many familiar companies that have a global reach and strong dividend culture. Japanese Equities: While Europe has been shunned by investors for several years, Japan has been ignored by most UK investors for decades thanks to a weak economy, a deflationary spiral and adverse demographics. But the country – which is the world’s third largest economy – has returned to favour in the wake of the bold economic reforms unveiled by prime minister Shinzo Abe in 2012. Indexed funds tend to focus on the large-cap part of the market although there are some ETFs that track Japanese smaller companies. Emerging Market Equities: While this part of the market tends to be more volatile than familiar UK equities, emerging market stocks offer the investor the promise of very strong long-term returns. Many investors prefer to take an active approach saying they are willing to pay extra for a manager to search through the vast universe to find the best companies, although there are indexed products from the likes of Vanguard and L&G that offer broad exposure to the whole of the emerging markets asset class. UK Government Bonds (Gilts): A fixed income component is essential for a truly diversified portfolio and government bonds are seen as being one of the least risky sections of this asset class. Avoiding government bonds over recent years would have caused investors to lose out on significant gains but investor could have accessed this through a number of low cost passives. Index Linked Gilts: When it comes to government bonds, investors can hold funds tracking conventional government debt or index-linked gilts, which offer a degree of protection against inflation. Corporate Bonds: While riskier than government debt, corporate bonds offer the prospect of higher returns in exchange for this and over recent years corporate bonds have delivered some of the best risk-adjusted returns in the market. Passives focusing on UK corporate bonds are relatively few in number, but those that do are run by the bigger, more recognisable firms in the industry. Property: Commercial property is another area that tends to lend itself to active management but passive advocates can find low-cost ways to access the asset class. In the open-ended space their options are limited to the BlackRock Global Property Securities Equity Tracker but FE Analytics shows a number of ETFs track UK property as well as that of other international markets. Commodities: Many ETFs give investors exposure to commodity prices, ranging from mainstream metals such as gold and copper to niche subsets such as lean hogs. The volatility associated with these products means they are not for the faint-hearted. Smart-beta: Smart-beta is the term given to passive funds that hone in on specific market themes. They follow bespoke indices designed to take advantage of perceived systematic biases or inefficiencies in the market. For example, some smart-beta products invest in indices designed to give investors exposure to stocks with a low volatility, whilst others target high dividend-paying stocks. In light of the new rating, FE Trustnet will soon be launching a section dedicated to passive funds.